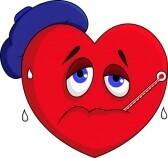 I just wanted to pop on really quick to let you all know that my DH & I have been extremely sick these last few days. I am feeling slightly better but still really weak with chills & not so pretty sweating fits. I will post on my blog again when I'm 100%. Have a good day all. What an awful way to start the New Year. I hope you recover and things perk up for both of you! Get well soon to you and your family, Jackie! Where's the dislik button? I don't like you being sick, Jackie! Please take care of yourself. We want you well again!!! Jackie, I hope you start to feel better soon! Hope you are feeling much better soon! Hugs and prayers! I hope you're feeling better! It's no fun being sick!